Cleaning with Baking Soda and Vinegar Mama Say What?! | Mama Say What?! My awesome mother-in-law let me in on a little secret (well at least new to me, the housewife newbie). You can clean a LOT with baking soda and vinegar! NO way! So, I figured I would give it a go on our fridge that had suffered a few yuck spills including beef juice and some sort of red fruit juice. It was a sticky, disgusting mess but with just 1 bucket full of hot water, 2 cups of vinegar and a few drops of liquid dish soap, it was gone! My refrigerator was clean in no time. I was beginning to think that my mother-in-law was on to something so I started to research. Here are a few of my favorite uses for baking soda and vinegar from my Mama Say What?! friends and myself. 1. Clean the fridge. Empty out the contents, even the shelves, and turn the temperature up (just don’t forget to turn it back down when you are finished). Take and bucket of hot water, 2 cups of vinegar and a few drops of dish detergent. Stir the mixture with a spoon and clean away. 2. Unclog your drain. You need 1 cup of baking soda, 1 cup of vinegar and 3 cups of BOILING water. 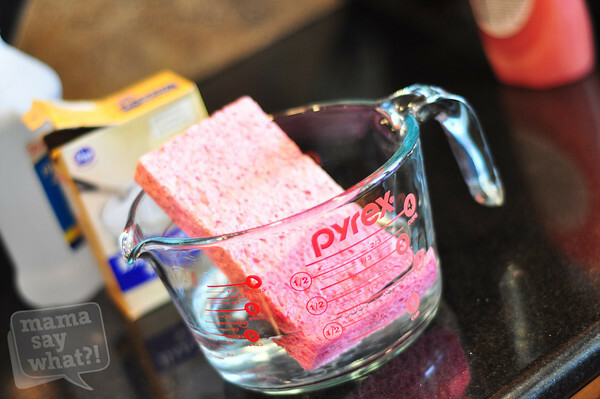 First, pour the baking soda down the drain (if you have a shallow drain like mine you may have to do a half cup twice) then follow it up with the vinegar (again use as much vinegar as you do baking soda, but don’t use it all if you still have another half cup of baking soda). Then sit back for a few minutes and watch the sink fizz. After a few minutes, add the boiling water to the drain. For very clogged drains you may have to repeat this process a few times. 3. Freshen up that morning brew. Take 1 part vinegar and 2 parts water and run it through your coffee pot. Repeat the process until the water comes out clear. 4. Breathe healthier. You can clean your humidifier with 1/2 c of vinegar and then turn the faucet on and just splash around the water and vinegar together until it is cleared out. time (make sure the water is hot), spray the cage, rinse and dry. 6. Who needs an all purpose cleaner? Once again fill an empty spray bottle with 1.5 cups warm water, 1 tbsp baking soda, 1 tbsp vinegar about 2 drops of dish detergent. Shake it up and enjoy fresh clean surfaces. 7. Your floors will sparkle and shine. Take a bucket of warm water and a cup of vinegar and the juice from a lemon. I clean by hand but it could easily be added to a mop bucket to mop instead. 8. No more stove top crust. 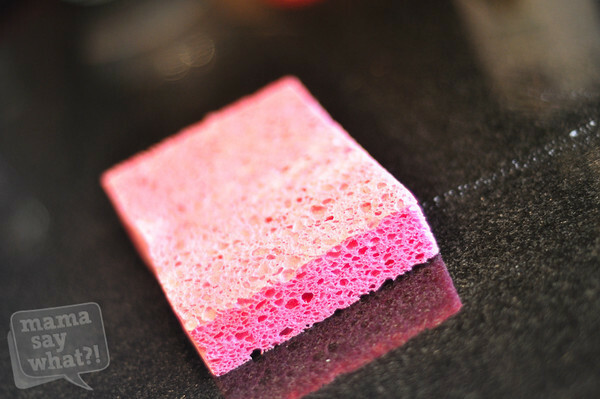 Use baking soda and a rag soaked in hot water to scrub your cooktop stove. 9. Goodbye, hard water stains. Use vinegar to soak dishes, utensils and cups that have hard water stains. Fill your sink with water and about ¼ cup vinegar and let it soak for at least an hour. If it’s really bad, you might want to let it soak overnight. 10. Clean front loaderwashing machines. Add vinegar instead detergent and run through a cleaning cycle (without clothes of course). Note that although recycling old spray bottles could work well for these natural at home cleaners, I suggest picking up a spray bottle (or two) from your local dollar store. Added by Miriam R. on June 8, 2012. Love this… Definitely going ton try this. lovely…always looking for ways to clean greener (not to mention healthier for babies and pets!). Pingback: Even More Uses for White Vinegar! Mama Say What?! | Mama Say What?! I love cleaning with these products and seeing others do it as well! It’s so much better for babies who are chewing on / sucking on random parts of the house anyway (like the floor). And it doesn’t leave a terrible chemical smell (much less residue) in the house! Thanks for writing about this!